Using graphite media on drawing paper, draw three or more geometric shapes using a variety of values, graphite pencils, and erasers. I’m not a huge fan of abstract geometric shapes, so I decided to draw something realistic composed of geometric shapes. A compact disc and its case provided me with several circles, a square, and a parallelogram to play with. 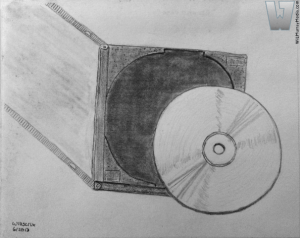 The most challenging parts of the drawing were the refracted light on the CD surface and trying to make the case cover appear transparent.